News of Barack Obama's historic election on November 4 dramatically increased demand for newspapers on November 5. Tall, bold headlines announcing the nation's new president transformed copies of the daily paper into collector's items. Though many publishers printed thousands of extra copies in anticipation of higher demand for their post-election issue, at newsstand prices, supply simply couldn't keep up with the surge in demand. On Wednesday morning, many looking to own a piece of history found only empty news boxes and long lines in front of newsstands. Not surprisingly, copies of major newspapers' November 5, 2008 issue began selling for as much as $200 on eBay and Craigslist. This is a classic example of how a market responds to an increase in demand. 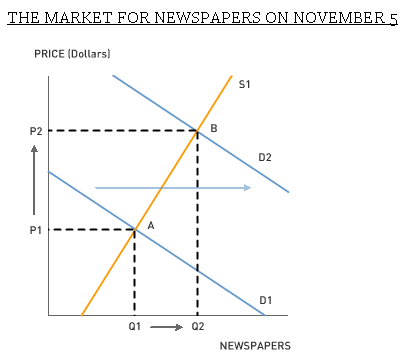 The market equilibrium on a normal day for newspapers is at point A with price P1 and quantity Q1. As the demand curve for newspapers shifts rightward from D1 to D2 (people want more newspapers at any given price level), both equilibrium quantity and equilibrium price of newspapers increase as a result—from P1 to P2, and Q1 to Q2. On November 5, the quantity of newspapers supplied increased in part because publishers anticipated higher demand and in part because they scrambled to reprint when demand was even higher than expected. In the end, more newspapers appeared in the market, and at higher prices. The new market equilibrium for newspapers on November 5 is now at point B. Though the consequences of the sudden shock in demand for November 5 newspapers are pretty much as expected, the reasons behind this shock are not so clear. Though newspapers received renewed attention after the election, newspaper circulation has fallen steadily across the country for years. 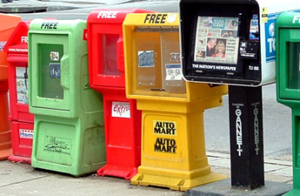 The ease of instant access to up-to-date information and the accessibility of free content have turned many readers to the Internet for news. The spike in demand for newspapers after the election raises interesting questions about the value of the daily newspaper in a digital world. 1. With the prominence of the Internet, why do you think people still wanted physical copies of newspapers with news they probably already knew? What factors do you think drove up the value of newspapers after the election? What do paper newspapers have that websites do not? 2. Some newspapers also raised the price of their November 5 issue. The Washington Post, for example, increased the price of their special post-election edition from $0.50 to $1.50. Considering the huge mark-ups for copies of November 5's newspaper on the Internet, why didn't newspapers raise their own prices even more, to, say, $20 per copy? 3. Does scarcity exist on the Internet? If so, how does it compare to scarcity offline? If not, how does that affect the value of virtual goods as compared to physical goods? Thank you for posting this great example of supply and demand shifters! Although I have already learned this concept a few months ago in my High School Economics AP class, it gave me a good scenario in which you can plainly see a shift in the demand curve. I will definitely be reading more of this blog in the future. It seems to me that the demand for newspapers goes up expectedly. More people buy the paper when they are expecting an article about an awaited topic, like the presidential campaign or a change in the current economic condition. We can almost predict when people will be more tuned in to the market for newspaper production. However, newspapers have lost market share in recent years with the development of the Internet and online articles like this one! Certainly this article does a great job of illustrating the supply and demand in the markets discussed. Thank you very much for your kind words, Andrew and Elaria! I hope you stick around.